As part of being a Helping Hand Artist I was lucky to receive a box of DecoArt products the other week and I have been having great fun experimenting with texture and metal techniques using some other products I have and mixing them together. I am focusing on building some samples for my next Country View Crafts workshop where I will teach some metal effects that I have devised and that can be used in both card making, mixed-media and altered art. 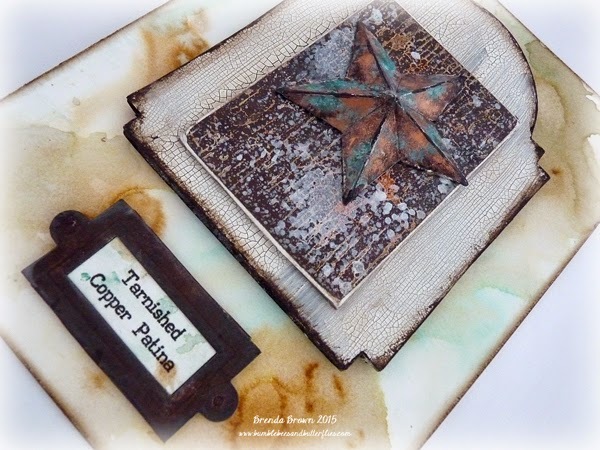 This is my first piece and I have used the Tim Holtz star to show off this particular effect. 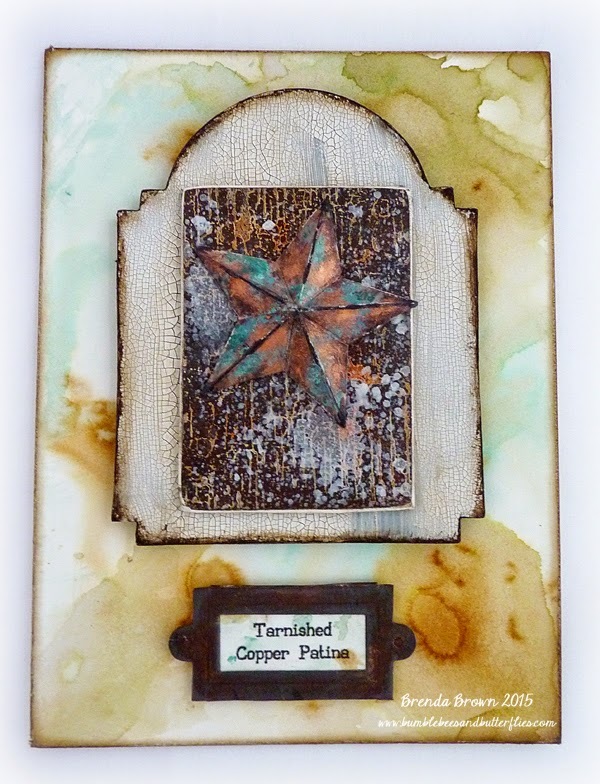 The tarnished copper patina star uses media fluid acrylics and patina cream antiquing cream with Onxyite Treasure Gold. The base it sits on is a Tando ATC on which I used a Andy Skinner rust technique I learnt on one of his workshops again using media fluid acrylics with a red metallic paint I have. Over it I stamped Andy's scratch stamp in media white gesso and gave it a coat of watery quinacridone gold, then when it was dry I sanded the edges back. A close up of the crackle on the cabinet card which is a foamboard base, I used the white crackle paint and added some raw umber to age the edges and a watery wash over the top. 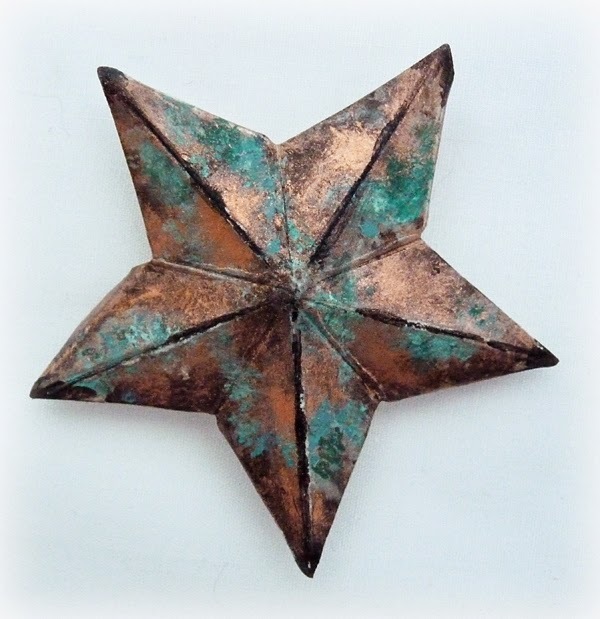 On the star you can see the glow of the copper and the fabulous green patina that can develop on it. There will be a few more boards being shown here over the coming weeks as I want one for each of the six metal effects I have devised. Thanks for stopping by and taking a look. This workshop will be up on Country View Crafts soon and if you can get to Flitwick in Bedfordshire fairly easily on the 6th June it would be lovely to see you. Fabulous project Brenda, I wish I could come to your workshops! I love the effect on all the elements you have used on this project. It looks amazing. Fabulous and great effects on that star! I just discovered the properties of Onyxide TG, (though I have had the pot for years) the effect together with the Patina Antiquing cream is brilliant! Wow, for this fab project you deserve a STAR! This is awesome, Brenda! The star looks exactly like aged copper. Ooo this is so cool! I love it! Wish I could get m hands on all this yummy decoarts media fluids...very hard to find in stock here in the states. Look forward to the next one. 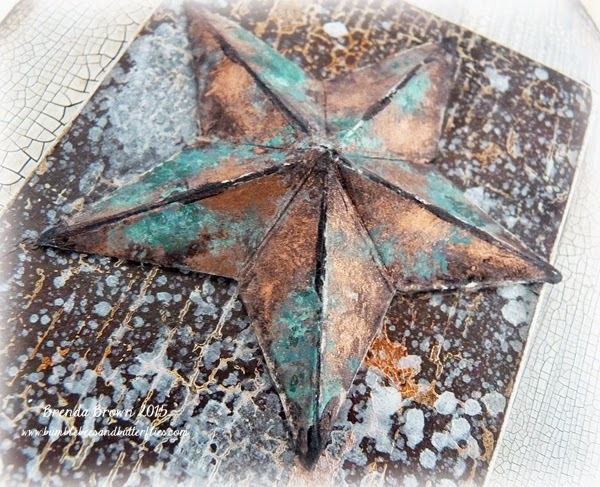 FAbulous copper effect on the star, and great crackle on the background. Wish I could wiggle my nose and be across the ocean for your workshop! It's bound to be a blast and informative! Wish I could join your workshop /course. Could you consider offering a workshop in Spain ( South ). The weather is much better...lol.. Thanks a lot for sharing your fab art and keeping on inspiring us. That star is fabulous! Looks so real! Oh did i say i love your plaque, well i do!!! Oh this is a favorite of mine, Brenda! I love all the texture and finishes using those fabulous mediums! Love this much! I sure hope to find some of DA mediums on our shopping adventure and if not, need to place an order! Hugs and soon! Fab effects from your metallic painty techniques - so many cool touches and fab inspiration.